Public vs private messages. Do you know the difference between the two when using Facebook? I have a love-hate relationship with Facebook. I love it because it allows me to stay connected to the people I’m close to, communicate easily with pretty much anyone, and share my happiest moments in life to a huge audience of people all at once. I also see a lot of cute dog videos on there, which is great. But what isn’t so great about Facebook is that I always need to be extra careful I don’t accidentally share something I don’t want to. The thing with Facebook is that nothing you do is anonymous. It is literally an online profile of yourself – your name, your photos, and your life exposed for everyone to see. So it’s important that you only share the things that you want to, because if you don’t it will be on your name forever! One common mistake that people make is not being able to distinguish between writing a post and private messaging. Believe it or not, people do mistakenly type private messages into the post section instead, and this message gets published for all to see! Now, although we’ve covered this topic in recent months, we thought we should revisit it in a little more detail, as it’s still a very common question. Here’s the distinction, so that you don’t make the same slip up! If you type a message into “Write something to [Friend’s Name]”, and then click “Post”, your friend will receive a notification and see this message on their wall. However, what some people don’t realise is that this message is also published for all to see! Anyone who goes onto your friend’s profile will see this on your friend’s wall. In addition, it will also appear on people’s Newsfeed – anyone who is on your Friend’s List will see this post on their Home page! This message you’ve written for your friend will be public. Only when you intend for others to see what you write to your friend (for example, if you want to wish them a Happy Birthday) do you use this feature to communicate with them. 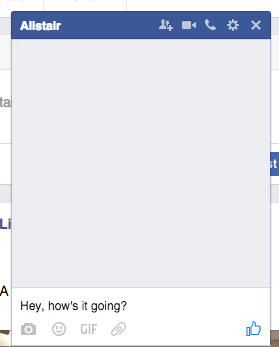 On your Newsfeed page, you’ll see the icon for private messaging on the top right-hand corner of the screen. If you click on this icon, you will be able to send private messages. These are messages that can only be seen by one person – the person you’re messaging. Once you click on this icon, a drop-down will appear. A list of names will appear in the drop-down. These are the people whom you have sent private messages to before. Click on the name of the person you would like to message, and their chat will appear at the bottom of your screen. Simply type your messages into this chat and press Enter on your keyboard. Done! Now you’re able to communicate with this person privately. None of what you say will be publicly published online. If you want to send a message to someone who doesn’t appear in the drop-down, click on “New Message” and select them from your Friend’s List. Hopefully you found this distinction between making a post and sending a private message helpful, because one is a public announcement, and the other is a private conversation! Have you ever made a mistake by posting what you thought was a private message on your friend’s timeline? Please share in the comments below. Thank you for this article. You really do need to be so careful. After having an issues with a stalker type I removed my facebook profile pic and changed it to remove my last name also. Thanks for your article,helpful information we all need to know! I always triple check before sending just in case, but I’m a bit over FB at the moment. I don’t use FB, but found this very interesting to read. Although a lot of my family want me to go on it, I just don’t have the time to be doing it and my computer is turned off most of the time. Thanks so much for your tips and the diligent way you went through it. Some of the msg’s that I read daily from “my friends” makes me think what happens to the privacy we once all had. Thank you for taking the time to write this down and illustrate it step by step. I find it very difficult to teach my mother about FB and all the ins and outs of privacy and she just ends up frustrated, confused and a little scared of it. She wants to connect with us kids though and her grandkids so it’s a real bee in her bonnet. I’ve emailed her this page so hopefully it will make a little more sense to her. So glad to help! We encounter many people who need this level of detail in our instructions, so your mother is not alone. Hopefully now she can get started on Facebook – it’s a wonderful way to stay connected to loved ones! I have everything locked down on FB, and still I’m wary of posting anything for privacy reasons. I do not trust FB. It is wise to be very careful on fb. Never ever made this mistake – fb is pretty easy to navigate and use. I am very careful about that. No, luckily I never made that mistake. I saw some friends of mine doing it!